Every year at this time Azaleas take center stage on the minds of many people around the world for four days. This is not because of any Azalea festival, but rather because they are featured so prominently at the Masters Golf Tournament, which is played just about sixty miles from us here at Park Seed. Even if the announcers covering the tournament didn’t draw attention to the famous Azaleas of Augusta National, it would still be impossible to miss the showers of showy, brightly-colored blooms around the borders of so many famous golf holes. Of course, as most fans of the tournament (or just of the associated shrubbery) already know, all sorts of fancy gardening tricks, including brining in plants from other parts of the country, are used to get those particular Azaleas to be in their fullest bloom for the exact weekend of the tournament. None of that, though, is at all necessary to have fantastic Azaleas blooming big in your garden. One of the main reasons that Azaleas are so popular is that they’re remarkably low-maintenance flowering shrubs, especially the Encore Azaleas. If you choose your planting location well, your Azaleas should be some of the easiest plants in your garden to care for. Azaleas do best in loose, well-drained soil. If you’re planting them in hard-packed dirt, just mix in some compost or sand to the soil around the root area to give them drainage. They prefer slightly acidic soil, so watch the pH around them, especially if there’s a lot of cement nearby that could break down and lower it. 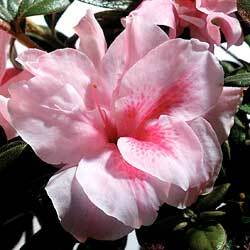 Plant Azaleas shallow and keep other plants that might compete away from the root structure. They’ll do best with some mulch down; this will regulate moisture and temperature, as well as providing most of the fertilizer that the bushes will need. If you prune your Azaleas, be sure to prune after they shrub is done flowering, but no later than mid-summer (around the end of July). If you keep these tips in mind, your Azaleas can easily provide you many years of trouble-free spring blooms.